Key Ultra Groups: Irriducibili (Unbreakables/ Indomitables), Eagles Supporters, Ultras Lazio. Other Ultra Groups: Banda Noantri (Our Gang), Viking Lazio, Commandos Monteverde Lazio (C.M.L ’74), Gruppi Associati Bianco Azzurri White and Blue Association Group), Folgore (Lightening), Boys, Marines, Gruppo Sconvolti (The Deranged Group), Gruppo Rock (Rock Group), Ultras 74, Brigate S.Giovanni (S Giovanni Brigade), I Golden Boys, Nucleo Armato Biancazzurro (Nuclear Armed White and Blue), I Vigilantes (The Vigliantes), I Leopard, Eagles’Korps, Gioventus Biancazzurra (White and Blue Youth), Eagles’Girls, Avanguardia (Vanguard) , In Basso a Destra (Down on the Right), Only White, and Caos Group. This was one of the greatest days in Lazio’s 114-year-history, the day they beat Roma in the Coppa Italia final. For the duration of the summer the Laziali revelled in schadenfreude, tormenting their Roman counterparts at every given opportunity. ‘Laziale or Romanista?’ There is perhaps no question more important in the eternal city. Founded in 1900, S.S. Lazio is the city’s oldest club. In 1927, when the National Fascist Party merged Rome’s biggest clubs, the Biancocelesti were the only ones to resist. Roma fans claim to support the club that truly represents Rome however Laziali are quick to remind them of who arrived first. The realm of Lazio’s Ultras – the Curva Nord of the Stadio Olimpico – is world renowned. It has been at the vanguard for some of Italy’s most colourful choreographies. The groups have changed but their support for the Aquile (Eagles) has been steadfast, none more so than the Irriducibili. In 1992 British flags adorned the Curva following the arrival of cult hero Paul Gascoigne. He was received warmly by the Irriducibili, whounveiled a banner depicting a pint of English beer with the message ‘It’s ready for you’. That year also saw the dissolution of Lazio’s first prominent Ultra group, The Eagles. They were formed in 1976, two years after the team’s first Scudetto success, which saw the numbers in the Curva proliferate. The arrival of food tycoon Sergio Cragnotti marked the beginning of one of the clubs most successful eras in which they won their second Scudetto in 2000. This coincided with the clubs centenary year and the Curva Nord’s celebrations brought 25,000 people onto the streets. Such was the popularity of the group that numbers oscillated between 6-7,000 people, sometimes even more. They became infamous nationwide and a feature which distinguished them was their merchandising business. The group franchised and sold their merchandise in and around Rome. This helped them provide their own away-day packages as well as fund their fanzine - La Voce Della Nord (The Voice of the North). In a sense the group gained brand notoriety. However their merchandising business was criticised by some in the Curva. This led to a schism in 2006 and a group called Banda Noantri (Our Gang) now known as In Basso a Destra (Low on the Right) were formed. Both groups co-existed in relative harmony mainly because of their ideological standpoint (both held neo-fascist sentiments), yet four years later a crossroads was reached. In 2010 the Irriducibili invited a politician, Renata Polverini, (from the moderate right) into the Curva during an election period. At a time where the club were struggling this angered other groups on the Curva. To add insult to injury the politician also sat on the portrait of Gabriele Sandri, a faux pas which was unforgivable. In respect for what they had done since 1987, Fabrizio Toffolo – the leader of the Irriducibili –announced the dismantling of the group on the radio. Having sought aid from a source that used to sit on the Curva Nord, it would appear the Ultras are now united under the banner of Ultras Lazio. This group is mostly comprised of youngsters and former Irriducibili members. Other smaller groups including Avanguardia, In Basso a Destra, Only White, and Caos Group also reside on the Curva. Unfortunately it’s impossible to discuss Lazio’s Ultras without mentioning their political extremism, something explored in depth in Football, Fascism and Fandom. At times heinous views have plagued the Curva Nord. Monkey grunts, racist banners and fascist memorabilia have all been used. One particularly unabashedly racist banner was unveiled against Roma reading “Auschwitz is your town; the ovens are your houses.” (The banner was a reference to Roma’s association with the Testaccio neighbourhood which has a Jewish population). Paolo Di Canio performed a fascist salute to the Curva Nord while playing for Lazio during a derby in 2005. Di Canio – a former Irriducibili member – saw the salute as a badge of identity with the Ultras. The Laziali have also suffered two tragedies. The first was back in 1979, after a Lazio fan called Vincenzo Paparelli was hit in the eye and killed by a flare fired by a Roma supporter. It was Italy’s first football related fatality. In November 2007, a 25-year-old by the name of Gabriele Sandri was shot and killed by a police officer. The police claimed the shooting was accidental after an officer (Luigi Spaccatorella) intervened to stop a fight between Lazio and Juventus supporters at a motorway service stop. Sandri’s death triggered nationwide outrage and emphasised the deep contempt Ultras feel towards the authorities. In the capital, Laziali and Romanisti united causing havoc across the city. Sandri’s funeral attracted over 5,000 mourners. The Laziali feel it is their duty to look after the clubs best interests. This has led to years of struggle with the Biancocelesti’s president, Claudio Lotito, a pantomime villain in the eyes of many. It appears strange that the Ultras would protest against a man who saved the club from liquidation. But during his tenure Lotito removed the policy of supplying the Irriducibili with 800 free tickets for matches. He also refused to fund the Curva Nord’s choreography and rejected a proposed takeover of the club by former Lazio legend Giorgio Chinaglia. Thus the ultras feel that the only way their Eagles can soar is to jettison Lotito. This season 6,000 supporters held a protest before their home game against Sassuolo. In the stadium thousands of placards reading ‘Libera Lazio’ (Free Lazio) were on display. At the time of writing, the Ultras have announced they will boycott games for the rest of the season as they continue their Anti-Lotito campaign. The Laziali and in particular the Irriducibili could be described as pioneers. Having transformed the style of support on the Curva their name has become, one of, if not the, biggest in the domain of the Italian Ultras. When sky blue fumes choke the air and the Curva Nord ripples under a gargantuan banner, to the back-drop of Vola Lazio Vola, the Stadio Olimpico truly becomes the heart-beat of this ancient city. Florence is one of the most beautiful cities in the world and is renowned for art and culture. It is therefore quite apt that it has a stadium that is one of the best examples of 20th century architecture in the whole of the city. Designed by architect Pier Luigi Nervi the stadium includes a huge tower called the “Tower of Marathon” which is 230ft tall. The concrete stadium has superb Roman style pillars at the entrance and once inside there is a perfect view from whatever seat you are given. The stadium was renovated for the 1990 World Cup and the changes were most notable when they removed the running track and adding extra seating. This now makes the stadium a purpose built football arena and the large capacity creates an electric atmosphere. One fantastic attribute this stadium has is that from the stands you can look out onto the rolling Tuscan hills, a view which is truly breath taking. The Ultras on the Curva Fiesole are known as La Vecchia Guardia Firenze and are loud well organised and fiercely anti Juventus. If you are going to watch football in Italy this is a venue that should be near the top of the list. Other Ultra/Fan Groups: Legione Viola (Purple Legion), Guelfi (Guelphs), Granducato (Grand Duchy), L’Alcool Campi (Alcohol Campi – signifying fields or a province called Campi in Florence), Vieussex, Settebello (Beautiful seven), Fiorenza 93, Firenze Ultras, Gruppo Storico Ultras V.’73, Aficionados, Urban Crew, Alterati (Altered state – drug related), Fedelissimi (Stalwart faith), Bomber Group, Pazzi di lei (Crazy for Fiorentina), Sindrome Viola (Purple Syndrome), Vecchio Stampo (Old Fashioned), Stati Liberi del Tifo (Supporters Free State), Viola Korps, Gruppo Signa (Signa Group) and MANY others!!! In 1289, a schism between the Pro-Papal Guelph forces of Florence and the imperial Ghibelline forces of Arezzo culminated in a brutal conflict at the Battle of Campaldino. This battlewas part of the long struggle between the popes and Holy Roman Emperors for power in Italy. It also reflected the fervent civic rivalries of the era, rivalries which remain to this day. On the blood strewn plains of Campaldino the Florentines and their allies triumphed. It was a victory that secured the Guelphs in Florence. The Tuscan Republic would go onto to become the birthplace of the Renaissance, a civic colossus on the Italian peninsula. Florence remains a city of unquestionable prestige and though the days of civic war are over, the city’s team – Fiorentina provide an outlet for campanilismo – or local patriotism. Expressions of Guelphism are often seen at the Stadio Artemio Franchi and under the aegis of the Ultras the city’s medieval splendour lives on. The rich heritage of Florence has seen the metropolis and its football club viewed by the supporters as one entity, a victory for La Viola being a victory for Florence. The team is the city’s symbolic army and it is these cultural nuances that set Fiorentina supporters apart in the world of the Italian ultras. Fiorentina are said to have the 6th largest following in Italy and this is exemplified in their numerous Ultra groups (I lost count around 100). This perhaps reveals a trait particular to Florence, the need for individuality and ingenuity are entwined with the city’s glorious past. The first origins of Viola fan groups can be traced back to 1965 with the formation of Vieussex (the name of a historic library in Florence) and Settebello (Beautiful 7). These two groups are present on the Curva today, with Vieussex residing in the Curva Ferrovia and Settebello in the Curva Fiesole, the heartbeat of the Artemio Franchi. One of the more renowned groups to have resided in the Curva Fiesole is the Ultras Viola (Purple Ultras). Formed in 1973, a vicious fight with the Genovese led some supporters to create a group of “super supporters” who could compete with any adversary. Founded and led by a man called Stefano Biagini aka ‘Pump’ this period is described by a Viola Ultra as the ‘glorious 70’s’ characterised by violent clashes, stolen banners, stadiums without police beatings, dangerous away days and above all the years of ‘Calcio vero’ (uncorrupted football). Despite the group’s prominence the Ultras Viola disbanded just 10 years after their inception following violent exchanges with Romanisti which saw their twinning with the Romans come to an abrupt end. Stolen banners (which both fans blamed on each other) sparked a irreconcilable quarrel and this combined with a rise in eminence of Colletivo Autonomo Viola or CAV (Autonomous Purple Collective) led to a changing of the guard. Created in 1978, CAV took a central position on the Curva and despite their dissolution in 2011 the group’s vestiges have ensured that the Fiesole remains one of the most vivacious Curvas on the peninsula. It is also worth highlighting Alcool Campi (Alcohol Campi) a clan who lived a brief but fiery existence. Tempestuous in nature this group were said to be the culprits in an infamous incident already alluded to in this series where Fiorentina Ultras launched petrol bombs onto a train full of Bologna fans. A 14 year old tragically died and Alcool Campi quickly ceased to exist. “Neither left nor right” has always been the motto of Fiorentina’s Ultras who have predominately refused political affiliation. This however does not have any bearing on their twinning’s and rivalries, epitomised in their longstanding friendship with Hellas Verona fans (traditionally right-wing) after ex-Fiorentina players joined the Gialloblu and helped them to their one and only Scudetto in 1985. It is impossible to talk about Fiorentina without mentioning their virulent hatred for Juventus. When the Bianconeri come to the Artemio Franchi a furore rages across the city. The origins of this rivalry date back to the 1981/82 Serie A season in which the Viola had the Scudetto snatched from their grasp by Juventus on account of some dubious refereeing. This rivalry was accentuated when Fiorentina’s cult hero Roberto Baggio was sold to Juventus in 1990, triggering riots across the city. In parts of the Tuscan capital you can buy stickers which read; zona anti-gobbizzata – hunchback-free zone. Hunchbacks are seen as lucky in Italy thus the nickname was patented for Juventus, a team seen as notoriously lucky. In what must be a sight to behold, albeit a strange one, Fiorentina fans have also been known to perform a ritual on players signed from Juventus in which they are ‘de-hunchbacked’. However this rivalry can take on a more sinister nature, with some Viola fans taunting their rivals about the Heysel tragedy which claimed the lives of 39 Juventini. Fiorentina fans have been known to wear Liverpool merchandise when facing their Turin adversaries, and following the tragedy in 1985 a banner was revealed by Fiorentina Ultras reading “39 less hunchbacks”. Juventus fans claim this is the reason for CAV’s attempt to befriend Liverpool fans back in 2009 after the two met in the Champions League. Despite this the Fiorentina Ultras are renowned for their loyalty, sarcasm and irony. They are no strangers to decrying the club’s hierarchy or the team itself if they feel things aren’t being done to their lofty Florentine standards. Former owner Vittorio Cecchi Gori, whose disastrous tenure at the club culminated in bankruptcy and demotion to Serie C2 in 2002 can certainly vouch for this. Viola fans had to endure the humiliation of losing the club name for a year, which became Florentia Viola, and 30,000 of them descended on the city centre to make their feelings known to Cecchi Gori. The hub of the Italian Renaissance, Florence is synonymous with famous names including Michelangelo, Dante, Machiavelli and the Medici. The Fiorentina Ultras take untrammelled pride in the city’s cultural history and the Artemio Franchi has become something of a holy ground for the Viola fanatics. Awash with purple and white the stadium can produce electrifying atmospheres and decorative choreographies that even the greatest Florentine artists would be proud to call their own. Other Ultra Groups: Visitors 1312, Livornesi, Livorno 1915, Doia Dè, Exarchia Club, Ultras Livorno 1976, Fossa 1977, Magenta, Fedayn, Sbanditi, Gruppo Autonomo, Norh Kaos. It was the first game of the 2004/05 Serie A season and newly promoted Livorno travelled to the San Siro to face AC Milan. The Tuscan’s earned a surprise 2-2 draw but for many Livorno fans (Livornesi), the result was trivial. The fixture transcended the average footballing rivalry. AC Milan were an economic juggernaut backed by media tycoon and then Italian president, Silvio Berlusconi. Livorno – a bastion of left-wing ideology –seized the opportunity to mock their ‘betters’, especially a certain signor Berlusconi. During the summer of 2004, Berlusconi had been pictured wearing a bandana while entertaining English Prime Minister, Tony Blair, and his wife Cherie in Sardinia. The Italian media claimed the bandana was disguising a hair transplant and the photo soon went viral. Roughly 10, 000 Livornesi turned up at the San Siro, 4,000 of whom wore white and maroon coloured bandanas with the inscription ‘Silvio we are coming’. The bating continued as they unveiled a banner reading “Berlusconi: Brocchi, chi ti vota.” The statement was a play on words. Christian Brocchi was an ex-Milan midfielder but colloquially the word Brocchi also signifies someone who is useless in a sporting context. Thus roughly translated the banner read “Berlusconi voters are useless.” Unsurprisingly Berlusconi took umbrage and Livorno were regularly fined for such flagrance. This never proved a deterrent and for every Berlusconi peccadillo; the Livorno fans have been on-hand to deride the politician. The history of this quintessential port town reveals how the Livornesi came to embrace this distinct identity. During the 15th century, the ruling Medici family of Florence constructed a port at Livorno and passed a range of laws, known as the Leggi Livornine, allowing merchants of any nation to colonise the republic. Jews, Turks, Moors, Armenians, Persians and others arrived creating a cosmopolitan city. Industrialisation and Italy’s Risorgimento (unification) added to the melting pot, with growing political activism among the city’s workers. In 1921, the formation of the Italian Communist Party in Livorno cemented the city’s left-wing tradition. This cultural and political history has proved immutable and since the inception of the Ultras Livorno in 1976, the Curva Nord of the Stadio Armando Picchi has been a constant outlet for Livornese identity. Before the formation of the famed Brigate Autonome Livornese (BAL) (Autonomous Livorno Brigade) in 1999, the Curva Nord was divided and disorganised. This was due to schisms between groups including Magenta , Fedayn, Sbandati and Gruppo Autonomo. However an amalgamation of the aforementioned quartet led to the inception of the BAL, whobrought structure to the Livorno support, underpinned by their leftist ideology. Communist symbols such as the ‘red star’ or the ‘hammer and sickle’ have been a leitmotif. Images of socialist icon Che Guevara adorn flags, scarves and t-shirts while a banner dedicated to the birthday of former Soviet leader, Joseph Stalin, has also been unveiled on the Curva Nord. Green, guerrilla styled military jackets and army styled caps – made famous by global revolutionaries like Cuba’s Fidel Castro – are often wornand the chanting of Communist anthems including Bandiera Rossa (The Red Flag) and Bella Ciao(a popular Partisan song during World War Two) act as further markers of the Livornesi’s politics.The BAL played a pivotal role in manifesting this ideology and in 2004; they celebrated the clubs return to Serie A after 55-years by organising a spectacular choreography. The Curva Nord shimmered under red placards, while a large image depicting a hammer and sickle placed within a shining sun was the centre-piece of the display. Underneath, a banner read ‘A long night is disappearing…at the horizon, our sun is rising’. Dr Mark Doidge, a sport sociologist who has written extensively on Livorno’s supporters and their politics, recognised that the choreography not only referred to a new beginning for the club, but also embodied Livornese identity through the use of Communist symbolism. This left-wing identity means the Ultras also seek to demonstrate solidarity with those less fortunate. In the past this has included the display of Palestinian flags, notably in a UEFA cup game against Israeli team Maccabi Haifa. Similar sympathy has been shown to the nationalist Irish cause and the IRA. The Armando Picchi has also been the setting for various fundraising projects, including collections for the Earthquakes that devastated the Italian city of L’Aquila in 2009 and a year later, Haiti. The Livorno born forward was a former member of the BAL and shared their political ideals. He often saluted the Ultras with the Communist ‘clenched fist’ and back in 1997, during an Italy U21 match in Livorno, he celebrated his goal by taking off his shirt to reveal an image of Che Guevara. The Italian media have drawn parallels between Lucarelli and Lazio icon, Paolo Di Canio, a player notorious for sharing the fascist ideals upheld by some of the Biancocelesti’s Ultras. In fact when Livorno faced Lazio back in 2006, the satirical television show La Iene broadcast a simultaneous interview with the two club icons. Both were quizzed on their political allegiances and the love for their respective clubs. Unsurprisingly Lazio and Hellas Verona are two of Livorno’s fiercest rivals due to the far-right contingent within their support. Indeed these fixtures are marked as high risk by Italian authorities and can often lead to violent clashes between opposition fans or with the police. Local and historic rivals, Pisa, are hated with equal verve. The Livornesi are twinned with the left-wing supporters of Greek side, AEK Athens, and French club, Olympique Marseille, in a friendship known as the ‘triangle brotherhood’. Although the BAL were the vanguard of the Livorno support it is said they coexisted with another group called ‘Norh Kaos’. Some speculated that there was friction between the two due to Norh Kaos’s affiliation to the far-right. Yet having read various sources it appears this wasn’t the case and the duo had an amicable relationship, inside and out of the stadium. DASPOS (banning orders) curtailed the numbers of the BAL and this eventually proved to be a factor in their dissolution. It is also said one of their former leaders, Lenny Bottai, altered his focus to pursue boxing (he’s reportedly doing quite well). Although their pseudonym allegedly survived until 2007, the Curva Nord lost some of its effervescence. Having consulted Dr. Doidge, he stated that three groups – Livornesi, Visitors and 1312 were preeminent on the Curva after the BAL disbanded. The latter two merged to form Visitors 1312. 1312 is the numerical code for ACAB – the acronym for ‘All Cops Are Bastards.’ This is a new aspect to ultras identity across Europe, uniting them in opposition to the police. The dogmas of the Livornesi set them apart in the landscape of the Italian Ultras, especially given the resurgence of far-right sentiments within Italian Stadia in recent years. Their club may continually struggle but their supporter’s spirits are never dampened and Mark Doidge mirrored this sentiment. Much of the information used in this article was courtesy of Mark Doidge, a doctor in the sociology of sport at Brighton University. He spent six months in Livorno with official supporters clubs and the ultras. This was the message that greeted Fabio Cannavaro on his return to Juventus in 2009. His two league titles with the Bianconeri did not spare him. He was regarded a traitor by the clubs Ultras, a player who had abandoned his team during their hour of need. Back in 2006 Juventus were relegated to Serie B in the wake of the Calciopoli scandal. While players like Gianluigi Buffon and Alessandro Del Piero remained, Cannavaro moved to Real Madrid. It is hard to begrudge such a career move but this treachery was neither forgotten nor forgiven. In the Ultras eyes it was his avarice which brought him back. A group known as Viking started circulating a t-shirt saying “Cannavaro mercenary” on the front and “No forgiveness for traitors” on the back. This treatment of a former club hero did not sit well with some of Juve’s supporters, but it exposes the visceral culture of the Ultras; one that borders on the extreme, but which has at its heart, is an unswerving passion for one club. Juventus are the most successful club in Italian history with 29 league titles (31 if you’re a Juventino). They are the Manchester United of Italy. You either love them or hate them and perhaps this is where the nickname La Fidanzata d’Italia (Italy’s girlfriend) originates. The club is the third oldest in Italy. It was founded in 1897 by a group of students from Turin and since 1923 they have been managed by the Agnelli family (founders and owners of FIAT). Juventus also have nationwide support. This is in part due to the influx of workers from the South who migrated to Turin to work at Mirafiori ­– the huge FIAT factory constructed on the edge of the city in 1939. FIAT provided thousands of jobs and Umberto Agnelli (former CEO at FIAT and chairman at Juventus) once claimed that ‘one of the reasons which led migrants to choose Turin during the great migrations of the 1950’s and 60’s was the possibility of going to see Juventus play’. This combined with the clubs huge success has seen their fan base become the largest in Italy with a surfeit of Ultra groups. The story of the Juventus Ultras is like no other written in this series. It reads like a script of the Borgias with its bewildering catalogue of schisms, reformations and civil war. The origins of the Bianconeri’s organised support can be traced back to two groups, Venceremos and Autonomia Bianconera. Formed in the mid-1970s both were positioned to the extreme left of the political spectrum, a stance which has changed considerably. In 1977, one of Juve’s most renowned Ultra groups, Gruppo Storico Fighters (Historic Fighters Group), was founded by Beppe Rossi, a man who remains a heroic figure among the Ultras today. Residing in the Curva Sud Scirea (or Curva Filadelfia as it was known in the old Stadio Olimpico) the vestiges of the group survive today. For ten years they enjoyed prominence among the landscape of the Italian Ultras yet the era would be marred by the darkest day in the history of Juventus. In 1985 on the 29th of May, 39 Juventus fans died at Heysel stadium during their European Cup final against Liverpool. Trouble had already flared when Liverpool fans breached a fence separating them from the Italians. In the maelstrom that followed, Juventus fans were crushed against a concrete wall which collapsed killing and injuring many people. The culpability lay with the Liverpool fans and Belgian authorities but in truth the stadium was too decrepit for a game of such magnitude. However for Juventini the blame was apportioned solely to Liverpool. An attempt was made to remove any ‘Englishness’ from the Curva and a virulent hatred was born. When the sides were drawn together in the Champions League in 2005; many Juve Ultras made their feelings clear by turning their backs on the choreography prepared by Liverpool at Anfield reading ‘Amicizia’ (friendship). In the return leg, banners were displayed reading ‘Easy to speak, difficult to pardon murders’ and ‘15-4-89. Sheffield. God exists’, the latter a reference to the Hillsborough disaster. The 1980’s also saw the inception of other influential Ultra groups including Viking (whose members hailed from Milan) and Nucleo Amato Bianconero. The latter changed their name to Nucleo 1985 in memory of the Heysel victims. In 1987, following the dissolution of Fighters due to brutal skirmishes with bitter rivals Fiorentina, Arancia Meccanica (Clockwork Orange) was formed. Inspired by the Stanley Kubrick film, the group was an amalgam of various splinters in the Curva Sud, and under the authorities behest their name was later changed to I Drughi (the Droogs). During their infancy their membership allegedly grew in excess of 10,000. However with the formation of Irriducibili Vallette (Vallette Unbreakables) who migrated to the Curva Nord and the re-emergence of the Fighters, the Ultras battled and squabbled among themselves. Following the Bianconeri’sChampions League triumph against Ajax in 1996 the jubilant fans rallied under the same banner, calling themselves the Black and White Fighters Gruppo Storico 1977. However this unification faded with the outbreak of internecine fighting. In 2005, yet again, the Fighters disbanded leaving the control of the Curva Sud up for grabs. This was compounded after the Turin giants were found guilty for their involvement in the Calciopoli scandal. A power struggle ensued and before a pre-season friendly against Alessandria in 2006 this reached an ugly peak. Allegedly, multifarious groups including Tradizione Bianconera (Black and White Tradition), Arditi (Daring ones - both comprised of former Fighters), Drughi, Irriducibili and Viking clashed in what can only be described as civil war. Two fans were stabbed and 50 were arrested. Allegedly this is not the only occasion Juventus Ultras have attacked each other. Today it would appear relative peace has been restored. The Fighters have returned to the Curva Sud Scirea and they are accompanied by Viking, the Drughi and a bourgeoning number of others. While it is hard to get one’s head round this clannish mentality, the internal divisions reflect elements of wider Italian society. Nonetheless the superfluity of Juventus Ultras can create one of the more colourful and eclectic atmospheres on the peninsula. Each group boasts their own banners creating a vibrant and multi-faceted choreography. This makes the chic Juventus stadium a cauldron on match days and there is rarely an empty seat. Set to the backdrop of the Alps, straddling the River Po, Turin is often referred to as the Industrial centre of Italy. The city’s armoury includes FIAT, ancient Egyptian artefacts, a myriad of contemporary art and the best chocolate in Italy. However to the Juventini, Turin is most importantly home to a juggernaut of Italian football and the Ultras thrive in the knowledge that their beloved Vecchia Signora is the envied queen of Italy. Key Ultra Groups: Fossa Dei Leoni, Commandos Tigre, Brigate Rossonere, Alternativa Rossonera, Guerrieri Ultras Curva Sud Milano, Avanguardia Rossanera, Curva Sud Milano. Other Groups: Gruppo Veleno, Estremi Rimedi, Vecchia Maniera, Ultras 1976, Panthers, Boys Assatanati, Il Gruppo Nervus, Il Gruppo the Bull Dog, Il Gruppo Avanguardia, Il Gruppo Barbera, Il Gruppo Zava, Pitbulls, Gruppo Comodo, Gruppo Caramello, Area 207, Armata Rossonera, Bad Boys, Acid Group, Banda Casciavit, Herbert Kilpin Firm, Banda Scalino, Barone Rossonero, Baschi Rossoneri, Black Sheep Group, Bomber Group, Brigate Venete, Brothers, Brutti Dentro, Cani Sciolti, Celtic Devils, Clan, Convinti, Dannati, Devils 1978, Diavoli di Como, Drunk Company Veneto Alcool, Eagles, Fanatic, Fedelissimi Milan, Feroci, Fronte Rossonero, Hooligans, I Diavolacci, Indyans, Kaos, Legionari Tigre, Inferno Rossonero, Mazzo Group, Mods, Nobilita Rossonera, Nucleo Tifosi Rossoneri, Out Laws, Panthers 1976, Ragazzi del ’99 ACM 1899, Sconvolts, Settembre Rossonero, Skunkati, Stars, Teste Matte, Tigers, Torcida Rossonera, Ubriachi di Milan, Vecchi Teschi, Villani, Warriors, Gioventu Rossonera. Not only were his performances questionable but his off field frivolities – including tweeting pictures at a nightclub on the Friday night before AC Milan’s weekend clash with Genoa – suggested he was less than committed to honouring the iconic red and black shirt. But while there was some justification behind this protest, the criticism reserved for Paolo Maldini during his 900th and last appearance for AC Milan against Roma in 2009 was baffling. It goes without saying Maldini is a club legend. A product of the primavera, Maldini won five European Cups and seven Scudetti over the course of a 25 year career. Yet after the Italians final match at the San Siro, his lap of honour was soured by a pocket of ultras who expressed their dissent. "Thanks captain. On the pitch you were an undying champion but you had no respect for those who made you rich," read one of the banners. "For your 25 years of glorious service you have the thanks of those who you called mercenaries and misers,"
The ill-feelings allegedly stemmed from an angry exchange between Maldini and Ultras who had awaited the teams return at Milan airport following their loss to Liverpool in the 2005 Champions League final. Giancarlo Capelli, an Ultras leader, later remarked “It was not a protest. We just wanted to make it clear what we thought about some of his comments and behaviour over the past years.” Throughout his career, Maldini hadn’t shied from condemning the Ultras whenever they had failed to support some of his teammates and his defence of Silvio Berlusconi’s transfer policy also appeared to irritate the fans. For us, it is hard to accept that a club legend would be subjected to such treatment, albeit from a minority. However the intensity of this incident reveals the visceral relationship between Ultras and their club. At times it feels like the macho response of a domineering spouse or spurned lover who feels they haven’t been awarded their due respect. While these actions are highly questionable and a flagrant offence to many a football purist, this apparently aberrant behaviour is part of the Ultras fabric. That AC Milan’s Ultras hold their players to such lofty standards is perhaps born out of the clubssuccess and prestige. Founded in 1899 as Milan Cricket and Football Club by English expatriates, Alfred Edwards and Herbert Kilpin, the Milanisti take great pride in the knowledge that their team is the oldest in the city and one of the most decorated in Europe (facts they are keen to flaunt when they play their city rivals, Inter). In honour of their Anglo-routes, AC Milan have retained the English spelling of the city’s name and this history is also celebrated by the supporters, most notably when the Ultras choreographed a gigantic banner of Kilpin in his archaic red and black shirt during the Rossoneri’s game against Barcelona in 2013. The display was accompanied by the date 1899 and the message ‘La Storia Siamo Noi’ (We are the history). The supporters may also have Kilpin to thank for the clubs iconic red and black colours and as a consequence their nickname - Il Diavolo (the devil). The Englishman is said to have arrived at this choice after saying “We are a team of devils. Our colours are red as fire, and black, to invoke fear in our opponents.” Indeed the San Siro can be one of the most daunting arenas in European football and the Ultras of the Curva Sud certainly thrive off theirmenacing moniker. Unsurprisingly, AC Milan’s status means they have a plethora of Ultra groups, none more renowned than the historic Fossa dei Leoni (Lion’s Den). The Fossa dei Leoni (FdL) were formed in 1968 and are said to be the first modern Ultra organisation in Italy. As such they played something of a pioneering role in the nascent years of the Ultras movement. Although the FdL originally resided on Ramp 18 of the Settori Popolari of the San Siro, in 1972 the group shifted to the Curva Sud and became the heartbeat of the Diavolo support. Accompanied by the Brigate Rossonere (Red and Black Brigade), founded in 1975, and Commandos Tigre (Tiger Commandos) who joined Brigate and Fossa on the Curva Sud in 1985, they formed a triumvirate that made the Rossoneri’s support one of the most eclectic on the peninsula. To emphasise the FdL’s cult nature, the group had their own song - ‘Leoni Armati’ (Armed Lions), inspired by the Italian film ‘L’armata Brancaleone’. Furthermore in 1982 theyfeatured in the Italian film ‘Eccezzziunale…veramente’, in which actor Diego Abatantuono played the role of the group’s leader, Donato ‘Ras della Fossa’. Given that the inception of the Italian Ultra movement was inextricably linked with the political activism of the era, curiously Fossa never adopted a clear political identity. It is said some of their members predominately veered towards the left, with images of Che Guevara visible in the San Siro during the groups early years. However many of the Ultras on the Curva Sud have avoided political affiliation and while rifts arose from a difference in ideology between Commandos, Brigate and Fossa the groups led the Curva for 20 years in relative harmony, that was until the FdL disbanded in 2005. The reason behind Fossa’s dissolution once again beggars belief. The story goes – and there are numerous accounts – that during a game between AC Milan and Juventus in 2005, the FdL managed to steal a banner from a Juve Ultra group known as Viking. Fossa proceeded to unfurl this banner in the Curva Sud as a trophy of their conquest however it later emerged that rather than stealing the banner, the Milanisti had obtained it “Senza Onore” (without honour). In other words the fans hadn’t physically fought to steal the banner and thus this went against what can only be described as an unwritten Ultras modus operandi. The Juventini desired revenge and a few days later an FdL banner was stolen by Viking and posted on the group’s fanzine. The plot thickens. The following Sunday the banners were back in the possession of their owners. Rumours spread that the swap had been organised in agreement with the police, a heinous crime in the world of the Ultras and much to the anathema of the other groups in the Curva Sud. The FdL ceased to exist, yet the conflict in the Curva Sud went on. Internecine warfare ensued. An AC Milan fan was shot in the legs. 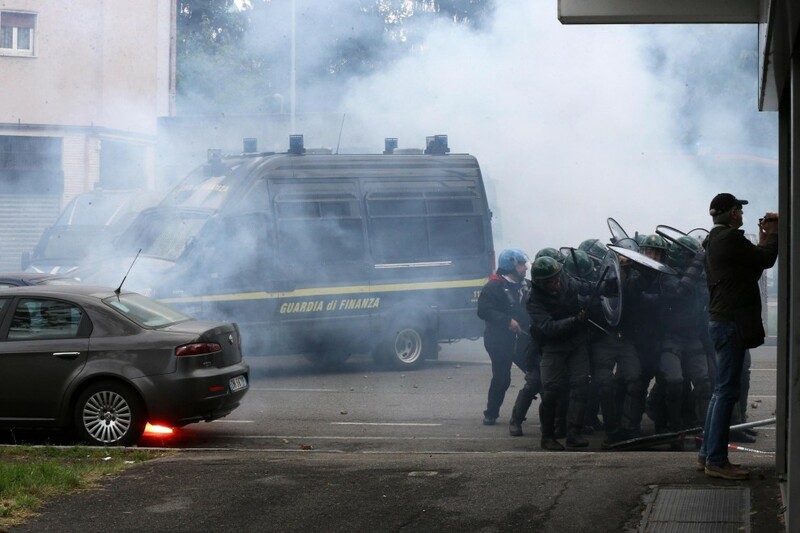 Monza magistrates concluded that the attack was part of an internal war amongst Rossoneri Ultras over merchandising and tickets. Commandos and Brigate lived on while new groups such as Guerrieri Ultras (Ultras Warriors)– formed of ex-FdL members – were born. Their motto ‘Neither red nor black, just black and red’ encapsulated their apolitical stance. The peace was eventually restored and now the majority of the Curva Sud has united under the umbrella of Curva Sud Milano. Their headquarters lie in the industrial area of San Giovanni but their members spread across the length of the peninsula. The infighting, the protests, their unabashed hubris and the revolving door in which groups form and disband all appears rather ludicrous. It is bemusing but undeniably beguiling. In the midst of all the chaos there are codes and rules that must be stringently followed. Its madness but there is a meticulous method to the Ultras madness. Imagine Italian football without them. Imagine the San Siro on a Champions League night without the Curva Sud, the match devoid of incessant chanting, flares, smoke and spectacular choreographies. In 2010, when Manchester United faced AC Milan in the Champions League knockout phase, Sir Alex Ferguson was left in awe. Not by the superstars on the field but by the supporters in the terraces. Therein lies the seductive power of these Ultras. Key Ultra Groups: CUCB (Commando Ultras Curva B), Ultras Napoli, Fedayn. But on occasion, murmurings could be heard. They were the cheers and jeers of the Stadio San Paolo. The world may not have changed, but S.S.C Napoli were on the brink of winning their first Serie A title in 61-years. A 1-1 draw with Fiorentina secured Napoli’s triumph. The city erupted. Exultant Neapolitan’s poured onto the streets. Days of partying began. Fans danced on rooftops, fireworks exploded, cars and buildings were draped in sky blue. In his book, Calcio, John Foot observed that “During the celebrations, Napoli fans displayed all the classic traits of what has become known as the Neapolitan ‘character’: irony, parody and a sense of the macabre, obscenity and blasphemy.” On the walls of the city’s graveyard, graffiti appeared in vernacular ‘Guagliu! E che ve sit pers!’, ‘Guys! You don’t know what you are missing.’ Satirical funerals were arranged for Juventus. The supporters paid homage to their heroes and one man stood above all others as the saviour of Naples – Diego Armando Maradona. The use of religiously infused language here is no coincidence. To this day, Maradona is awarded god like status in the city. During the Argentinian’s spell at Napoli the club won their only two Scudetti as well as a UEFA Cup in 1989. This prompted cult like adoration. Thousands of babies were named Diego or even Diega while streets and neighbourhoods also took the revered name. Murals were made comparing him to the city’s patron saint San Gennaro. One even depicted him in the arms of the saint himself. His humble background and ‘rebellious’ nature struck a chord with the Napoletani. His passion, volatility and footballing genius reflected Neapolitan character. In a sense, Maradona became an adopted son of Naples. But perhaps more importantly, the Argentinian had helped Napoli break the overwhelming dominance established by the affluent Northern trio of Juventus, AC Milan and Inter. At a time when the hostile, anti-southern politics of northern regionalist parties such as Lega Nord were taking hold in the terraces of northern clubs, Maradona restored pride to the ‘downtrodden’ city of Naples. The Napoletani now had a riposte to the anti-Neapolitan rhetoric. It was smug and simple: ‘May 1987, the other Italy has been defeated, a new empire is born.’ And Napoli’s fanatical support still revel in the memories of a time when the giants of the North were humbled by a resurgent Naples. The Partenopei are the fourth-best-supported team in Italy and their following also extends to various corners of the globe. According to Italian sports journalist Domenico Carratelli, Napoli is a club that “…brings people together from all walks of life, rich and poor alike. It is the people’s team.” Surprisingly, barring their transient success in the late 1980’s, there is a paucity of major honours. Nevertheless, this has rarely detracted from the devotion of their support and even after the club went bankrupt and were relegated to Serie C1 back in 2004, they broke divisional records for attendance, with numbers in excess of 50,000. One urban myth claims that the roar of the crowd celebrating a Napoli goal at the San Paolo has occasionally been registered on the seismographs at the cities Federico II University. The story of Napoli’s Ultras is perhaps best summarised as a tale of two Curva’s, Curva A (the north bend) and Curva B (the south). Over time, the Curva A has assumed a more prominent role and has been home to a variety of groups including: Mastiffs, Vecchi Lions, Teste Matte and Brigata Carolina. Yet, a divide has always characterised the relationship between Curva A and B, with the former being notoriously riotous and the latter more ‘tranquil’. This, however, only serves to rouse one of the most charged atmospheres in Serie A. The Azzurri’s first Ultra group to create match-day choreographies were the Commandos Ultras Curva B (CUCB). Founded in 1972 by Gennaro Montuori, AKA ‘Palummella’, the group quickly established themselves by creating their own newspaper and television programme. During their existence, CUCB allegedly denounced violence, a sentiment reflected in a banner they unveiled back in the 1980’s: ‘Violence divides us, our passion unites us.’ According to Signorelli, who authored Popular Culture in Naples, this period also saw the inception of women’s Ultra groups, including Ultra Girls and Ladies Napoli, the latter formed by University lecturers. Unsurprisingly, the CUCB ‘glory days’ came during the Azzurri’s Scudetto winning years. The archaic San Paolo would bounce to the rhythm of ‘Porompompero’ while the Ultras ubiquitous presence at away games would ensure that a pocket of an Italian stadium would be transformed into a mini-Naples for the afternoon. However the departure of ‘Palummella’, supposedly due to the death of his brother, caused CUCB to disband. As a result Fedayn (1979) and Ultras Napoli monopolised the Curva B. The two have lived an uncomfortable coexistence, with both refusing to chant in tandem. Fedayn’s more belligerent reputation saw them receive an invitation to join the Curva A, their slogan ‘Estranei alla Massa’ – ‘Outside the Norm’ encapsulating their intransigence. Indeed the Fedayn’s reputation makes the Curva B’s more ‘serene’ tag somewhat risible. While Napoli’s ultras have often declared themselves apolitical, the historic and cultural divide between North and South has dictated some of their fiercest rivalries. Historian Nicholas Doumanis, has argued that the northern and southern halves of Italy appear in social, cultural and economic terms to be two very different countries. Parties like Lega Nord have even advocated secession from the south altogether. The Napoletani are frequently subjected to territorial discrimination and insults range from the city being destroyed by their neighbouring volcano Vesuvius, to the people being dirty and carrying cholera. Fixtures against Juventus, Hellas Verona, AC Milan and Inter are particularly explosive. For all this bravado, these rivalries also reveal the more sinister elements of Italian football and Napoli’s ultras have been involved in some deplorable violence. On May 3rd, 2014, people tuned into the Coppa Italia final between Napoli and Fiorentina only to witness scenes of anarchy and chaos. Violent clashes between opposition fans had delayed the games kick-off. Three Napoli fans were hospitalised. One, Ciro Esposito, would die from gunshot wounds after weeks in a critical condition. It later emerged that the Napoletani had clashed with A.S. Roma fans, despite the Giallorossi not even participating in the final. A Roma ultra, Daniele De Santis, was later charged with the death of Esposito. There is no love lost between Napoli and Roma, a game which according to a life-long Napoli fan, is one of the most hostile in Italy because unlike their Northern rivals, their hatred is concentrated solely on football. The other enduring image was that of, Gennaro De Tommaso, also known as Genny ‘the swine’. Said to be an Ultras leader in the Curva A, reports circulated that he was the man charged with talking to Napoli captain, Marek Hamsik, about having the game postponed as rumours swept the stadium that Esposito had died. The game went ahead and Rome’s police commissioner would later deny there had been any negotiation. Massimo Mazza claimed police had merely asked Hamsik to inform the fans of Esposito’s condition. Having already been banned from attending stadiums for five years, De Tommaso was arrested in September along with four other Ultras for their involvement in the Coppa Italia final, with charges including ‘throwing hazardous materials and invasion of a pitch at a sporting event.’ The incident made for a chilling spectacle and people like De Tommaso bring shame upon Il Calcio. While Napoli’s Ultras cannot be held accountable for the actions of mindless individuals, their violent reputation is not fabricated. Thus one is left at odds. On the one hand there is no place for such criminal behaviour, let alone in football. On the other, without the Ultras we wouldn’t enjoy the moments that make spines tingle and hairs stand on end. Moments such as the famed repetition of ‘Gonzalooo Higuaín’ nine times while the decrepit walls of the Stadio San Paolo shudder. The famous expression: ‘See Naples and die’ portrays the beauty and excitement of this city. After playing against Napoli for Manchester City, Ivory Coast midfielder Yaya Toure observed that the relationship between the Napoletani and their team was visceral, comparable to the love shown between a mother and her son. It is this passion that produces one of the most awe-inspiring yet intimidating atmospheres in European football.